Samsung has just announced the latest generation of their high-end consumer PCIe-based NVMe SSDs. 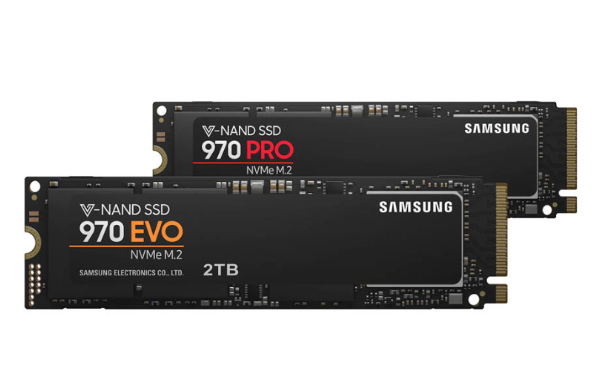 Dubbed the 970 Pro and 970 Evo, these SSDs feature Samsung’s newest 3D NAND and a brand new controller called Phoenix. Both will only be available in the M.2 2280 form factor. The 970 Pro supports the PCIe 3.0 x4 interface and also NVMe 1.3. It is fitted with Samsung’s 64-layer 3D MLC V-NAND and offers sequential read and write performance of up to 3.5GB/s and 2.7GB/s respectively. It can also achieve random 4k read and write speeds of up to 500,000 IOPs. The SSD 970 Pro will only be available in 512GB and 1TB capacities.